Image Below Or Add To Cart Beretta M92F 8MM Blank Firing Gun Replica-Bruni Mod. 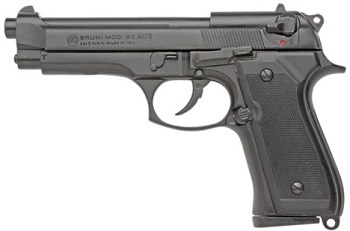 92 Auto: This is a variation of a world famous semi automatic Italian military handgun. It is an official sidearm of the U.S. Army and other U.S. government agencies. Our authentic, full sized, fully operative, blank firing reproduction weighs and feels like the original. Fires extra loud 8 mm blanks in both single and double action. This model has a modified trigger guard to suit a two-handed grip and extended magazine base. It is Great as a Movie prop, Military training Gun, Police training Pistol, Gun Safety Training, collecting and as a Display Gun. Authentic full sized, full operative blank firing reproduction. Comes complete with a Magazine and a Hard-shell Carrying case. Length 8 ¾” Weight 2 lb 2 oz. Fires 16 8MM rounds. Model M92F 8 MM Blank Firing Gun.